The next sculpter I want to shine a spotlight on is the undisputed master of the macabre, Helge Wilhelm Dahl. He has a really unique artistic perspective, particularly on Chaos Daemons. He makes me want to start an all-Daemon army, as soon as I finish with my Death Guard. Dahl’s daemons take a radically different approach than the typical Games Workshop daemonic style. Instead of the campy, comic book daemons that we’re used to in Warhammer, Dahl’s daemons are a nightmarish blend of fabulously bizarre contradictions. Gothic horror mixed with ghoulish fevered imagination mixed with mismatched juxtapositions (such as baby faces), all woven together with an elegantly weird sense of proportions. The use of baby faces, as masks worn by the daemons rather than organic features of the daemons, forcefully reminds me that the Ruinous Power in the Warhammer universe exist and are fuelled by human emotions. Despite being profoundly alien, Chaos daemons reflect the basic and strongest aspects of our humanity. Using the inhuman elements to teach the audience truths about humanity is an integral part of any good sci-fi world building, and Dahl really brings this to the fore. The baby faces are the most obvious of many stark contrasts which Dahl’s conversions utilise, but the subtler ones are just as delicious. 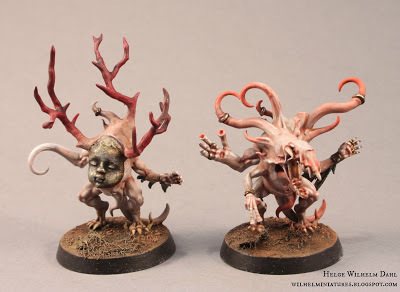 I’m so drawn to the baby/daemon contrast that I’ve tried coming up with ways to ham-fist them into my Nurgle forces, but eventually I had to admit that they wouldn’t suit that aesthetic, so instead Dahl has inspired me to build a whole separate army in homage. I love the contrasting proportions that he uses with the daemons walking on stilts, claws, and other mechanical appendages. They really are the stuff of nightmares, and they have the added effect of drawing in the viewer to the sense of movement of his miniatures. I can’t help but imagine the daemons variously lurching, sliding, crawling, scuttling and stomping towards their foes. I’m planning to use the stilt-like locomotion on a unit or two of Plaguebearers, for summoning into battle by my Death Guard army. Later on, if I’m ever able to complete the pure daemonic Dahl-esque army I’m dreaming of now, they’ll fit in perfectly there too. Dahl’s daemon sculpts are so fiendishly bizarre that they don’t always fit into the neat little boxes provided by the standard Warhammer Chaos pantheon. Some of them look violently aggressive, but not in the screaming-fit-of-blood-rage kind of way that Khorne usually uses. Instead they bring to mind a much more sinister sense of the implacable march of death. 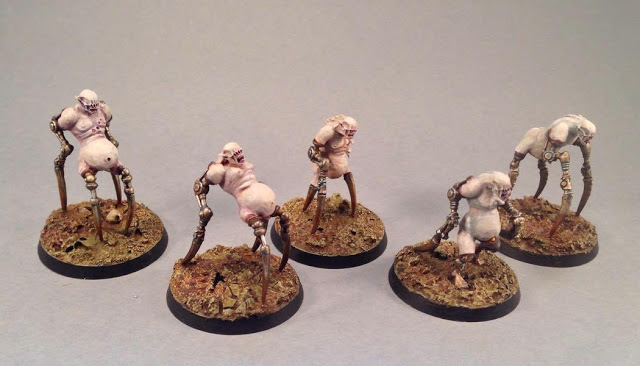 Some of them look disgustingly putrid, but not in the obesity-and-filth kind of way that Nurgle usually expemplifies. Perhaps the closest match is to Tzeenth, owing mostly to Tzeentch’s shapeshifting proclivities, allowing almost any aesthetic to fall within its realm. But even there, Dahl’s take on Tzeentch is uniquely his own. It’s this innovative creativity that most inspires me, including admittedly no small amount of envy. If I do get to build the Daemon army that I’m planning, I don’t think I could match it to any of the main four Chaos gods. Perhaps I’d just mix them all together as a broadly daemonic force. Or I might call them worshippers of Malice / Malal. That would entail needing to build my own body of lore for them though, because there’s scant information available about the fifth Chaos god (presumably due to Malal being dropped from canon years ago following a copywrite dispute). From what little bits I’ve found, Malal represents more than just hatred or malice. He’s also the god of paradox, which seems like the perfect deity for daemons as outlandishly contradictory as Dahl’s. To see more of Dahl’s amazing work, check out his blog. He also has some great painting tutorials there, including a recent one that I’ll use when I get to painting my Poxwalkers. All of the pictures shown in this post are the property of Helge Wilhelm Dahl. Warhammer, Nurgle, and the other Chaos gods, etc are all the property of Games Workshop.